“It’s not about the size you wear. It’s about how you wear the size.” At Jovani, we could not agree more. That is why we have created real sizes that fit every body. Jovani prom dresses fit petite and small boned women. They also flatter the gorgeously curvy plus size women. We have everything from small to larger sizes (0 – 24). 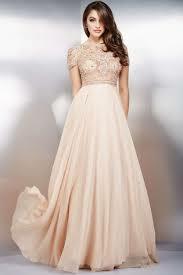 We believe that every woman deserves to find the most beautiful gown for her special occasion or formal event. That’s especially for prom. It’s a night when everyone looks their best. Unfortunately, high school can be a difficult time to maintain a healthy self-esteem. Girls are maturing into young women. Along with growing up comes the need to embrace yourself and find love for who you are. Own your inner and outer beauty, and radiate confidence, happiness and a true passion for life. The world is your oyster at this age, and the possibilities in life are truly endless. There is no point beating yourself up over your looks. Perfection is a myth. Models are the ones who are on the fringe body-wise. Just think – how many women do we actually know in real life who are six feet tall and waif thin with billowing curls, doe eyes and pouty lips? They may be everywhere in magazines, but in real life, most women have curves. What makes us as women radiate beauty is confidence. Giving girls and women confidence has always been a top priority with our designers. Plus sizes are celebrated the same as smaller sizes. Women should flaunt and flatter their curves with a stunning, well-designed gown. Don’t settle for a poorly-designed plus size dress with nothing special about it. Find a dress that is fabulously designed and impeccably constructed… one that is uniquely you and just so happens to come just in your size. This beautiful beaded gown just may be one of our favorites. The neckline and cut of the straps flatters a large bust, and the silhouette is very Marilyn Monroe. The higher waistband lengthens legs and the fit of the backside hugs and flatters in all the right places. For girls who want to channel their inner fairytale princess at prom, look no further. What we love about this dress is it makes wearing a supportive bra possible. That’s a feat that not every prom dress can accomplish. Though strapless is a fun look, strapless bras are not as good at holding the ladies in place while tearing up the dance floor. This gown is so romantic and flows beautifully as you move thanks to the a-line ballgown skirt. The champagne color of this gown looks stunning on dark haired beauties. Like the option above, it keeps you comfortable and covered while embracing your curves. It will make you look so feminine and delicate. The simple skirt has movement and an a-line silhouette. We love that the beading on the top half draws the eye upward to the face. Lace overlay is one of the most popular runway trends right now, and for good reason. Lace is timeless and romantic, and the dark gray color of this gown is sleek and slimming. This is a very flattering silhouette for many body types. The mermaid skirt hugs a curvaceous bottom and flares to balance your shape. The v-neck with cap sleeves on top allow for ample coverage with a peek of classy cleavage. A ponte knit bodice and a silk beaded skirt make this black dress exquisite for prom. If you prefer to cover your arms, or love the simple elegance of a dress with sleeves, this is the dress for you. Though a black dress is neutral and gorgeous on any woman, we particularly love how blonde and red hair pops with a black dress. Pick a gown you can dance, have fun and just be yourself in. It may be one of the fanciest and most glamorous nights of your life. However, you won’t have a ball if you don’t honor your beauty and uniqueness on the inside too. wow.,Nice collection this is the perfect blog to choose the dresses.